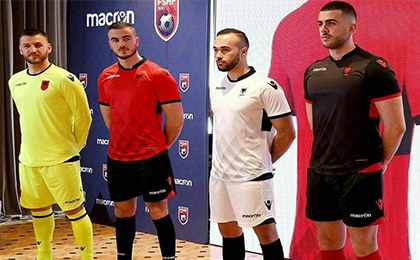 If you want to buy cheap albania shirt for 2018-19 season, buy it here in cheap-football.com , Check our exclusive range of albania Football Shirts / Soccer Jerseys and Kits for adults and children at amazing prices. Get the cheap albania jersey shirts, soccer kits with wholesale price, Free Shipping Worldwide! Albania national football team is the men's football team that has represented Albania in international competition since 1946. Albania was the winner of the 1946 Balkan Cup and the 2000 Malta Rothmans International Tournament, but had never participated in any major UEFA or FIFA tournament until 2016.At Euro 2016, Albania made its first debut at a major men's football tournament. Albania scored their first ever goal in a major tournament and secured their first ever win in a European Championship, when they beat Romania on 19 June 2016.